Maintenance, accessories, operation. Anything to do with making your erg work. I have a Model D that I bought new only a few months ago. I leave the damper at the same place, on the line between 5 and 6. Oddly, when I look at my past workouts, the drag factor has been changing from one workout to the next, without my touching the damper. For example on my pyramid speed interval workout today the df was 130. My previous workout a few days ago was a 10k -- df was 122. A 3000m piece I did the day before that shows 125. Why is there so much variability? Does it vary with the stroke rate? Or maybe the pace? I suppose at fast pace there may be more drag with the same damper air flow than at slow pace. If that's true, then we probably have to check and set dampers differently for different anticipated workout paces. Or maybe it's a good thing to have it automatically run at a lower df for long steady states and higher for faster paced workouts. Cheers, the C2 PM self-calibrates by recalculating drag factor every pull. There's always some stroke-to-stroke variation for reasons that may include temperature and humidity fluctuations; currents in the surrounding air; etc. This may or may not reflect itself in the DF shown by (say) ErgData for any given piece. It's possible to track the variations on either stroke-to-stroke or average-for-an-interval-piece bases using 3d-party software that emulates a PM. ErgMonitor (sadly no longer supported by the authors) did this -- here the calculated DF for the stroke is 90.4 and the average DF for the interval to that point is 95.8. This sort of thing is absolutely normal in indoor rowing, and variations of 5 or 6 DF basis points are completely within the realm of the expected. There's absolutely no reason to obsess over damper setting during any given workout or constantly worry about resetting it. 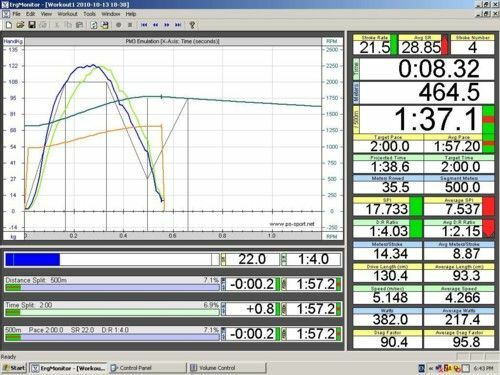 The monitor will take any changes in/ DF into account when working out watts/pace. Have you checked the PM3/PM4/PM5 is configured for the right model? Although the range of df numbers observed with an unchanged lever setting may seem large, your sample is very small and the single observed corellation/proposed cause is varying intensity of (average) effort. There are a number of environmental influences on df readings. Dust occluding air exhaust from the fan is the culprit most often mentioned, barometric pressure less often. As is the case with the presence of dirt in the fan cage, the Influence of barometric pressure can be compensated but not without moving the shutter lever. We check current df on the monitor. Then we move the lever to adjust df to our accustomed or desired number. There is no fixed and unvarying df produced by any particular lever position. I’m curious if you have the habit of “set and forget” in the monitor but are also looking after the fact at an average df generated by a program such as ErgData which records df stroke by stroke in a .csv file? Our habits of mind frequently don’t keep pace with changes in our customary rituals. Also, don't forget that additional external factors such as a fan blowing on you (and the flywheel air inlet area) can sometimes affect the DF. I have no fan running in the room and the ac vent is far away. Also, too short of a time interval to assume much change in dust levels -- none visible on the outside. I set and forget as you say, with average df given for the piece after the fact, using ErgData. More data -- last 18 pieces were 130,122,122,121,125,121,123,121,122,127,127,127,127,127,125,122,121, all with same damper. Different types of pieces including long steady states, intervals, easy warmups, short fast sprints. Doesn't actually seem to correlate with pace, distance, or stroke rate either, but just fairly random. No significant change in barometric pressure I think. I chose a while back what I thought was an appropriate df and have left the damper as is, presuming the df would not change from day to day. Seems odd to range from 121 up to 127 for a while then back down to 121 and today up to 130. The model D and PM5 are quite new, with latest firmware update. Wonder if it may have to do with force curve variability from piece to piece, including the efficiency of the catch and steepness of the force curve upslope. I've seen it recommended to get the legs down really quickly, which gives a leftward leaning force curve, but also conversely recommendations for a smoother and more symmetrical haystack. Seems the latter would be less abrupt and more efficient. I suppose another possibility could be with the proportion of time in the recovery vs drive phases. Sometimes (mostly on the weekend) I'm the only one who uses the Model E at the gym at work. I always check the DF at the start of a row and set it at either 119 or 120. Sometimes, even though the lever handle hasn't been touched (unless gremlins come in and move it just a teeny, teeny bit to mess with me) when I go in on Sunday I do have to tweak it just a bit to get it back to 120. I haven't noticed any particular trends in the changes, but I do know that the changes in DF are pretty small (say, +/- 2) and the changes I have to apply at the lever are also very small. It might be atmospheric conditions, the wall fan, etc, I don't know. Either way, it's no big deal - I just take a few seconds to reset it, do my usual warm-up, and off I go. Unless you find yourself moving the damper lever all over the place chasing your preferred DF, I wouldn't worry about it. There is no fixed and unvarying df produced by any particular lever position. If you want a particular df, check df in the monitor. if It isn’t the df of your ’s desire, jog the shutter lever, check the effect on df, repeat until satisfied. Ain’t rocket surgery fer cats sake! Why is there so much variability? Evidently this readout is unreliable; only physical events when pulling the handle are reality, not their expression in a readout. If we feel the drag is the same, it is. The DF readout you see may not be the value used in PM calculations for each single stroke; especially if seen on external gear that does not itself do any sums but only uses PM display data and not the original data stream from the flywheel. The critical PM power data is accurate since it is averaged, but single PM and external readings that are not averaged can only be subject to large variation: the flywheel impulse stream is at about 50Hz, and a typical pull is 0.7s. If the monitor is correctly configured. Then the next fix is to clean the flywheel cage including behind the flywheel where the sensor is located. While you have things open check the three magnets are in place. @Ombrax --my variations are evidently much wider than yours. But we are measuring differently. Yours are the setup at the beginning of the row and mine are the ones reported in the logbook after a workout (at least for those of us using ErgData). If you or anyone else uses ErgData, I'm curious if you have similar variability in those averages. As for chasing a preferred DF, it's not that. I'm fine having it meander somewhat. I assume the measurements are accurate, since if they weren't, then that would negate the standardization and validity of indoor erg testing and racing. Presuming they are accurate, I wonder what factors account for the variability and if they indicate technique flaws or potential for improved efficiency. @jackarabit -- as above, it's not the starting df that I'm looking for, but rather an explanation for the variability in the measured df averages and whether there is something to be learned from it. @jamesg -- interesting idea that the readout is likely flawed or that perhaps ErgData doesn't gather the full dataset used by the PM. But in general it seems that ErgData actually gathers the same and beyond what the PM holds. I assume it's the average for the whole piece that is reflected in the final logbook entry. @Citroen -- I can take a look inside, but if gathering dust I would think the trend would just be a gradual increase in DF rather than jumping back and forth. If someone else uses ErgData or sees the DF in their logbook, I wonder if they have similar variability from day to day. @NavigationHazard -- wow, that's quite a display with ErgMonitor. Any good insights with it for improving efficiency? My suggestion is nothing to do with clogging of the fan cage, it's to do with clogging of the hall effect sensor that picks up the magnetic flux from the magnets. You may need to remove the sensor housing from the outside left side of the cage to clean it thoroughly. What should we project, speculate or prophecy to be the electronic takeaway from machining swarf collected on the sensor magnets? I found that condition in my model D in early 2015. I didn’t have ED so no post-row df artifacts begging for causal attribution. I was getting force curves on a PM3 which did not “connect the dots” in the manner to which I had become accustomed. I worried about effed up phenomenological cowinkidinks for a day or two and then stopped. Actually, I just noticed that I have a DF number on a workout when I didn't use ErgData (up at 130), so ErgData is evidently not the culprit. In fact, the opposite may be true, that the ErgData ones are perhaps more accurate than the ones without.